I am sitting in the Press Box of the Toledo Mud Hens, thanks Roger! If you are like me when you hear that name, Toledo Mud Hens, you instantly think of the show “MASH”, specifically “Corporal Klinger”. In the show, Klinger is proud of his family, and of his hometown, which he regularly mentions. In addition, he is an enthusiastic Toledo Mud Hens baseball fan and as his character evolved, he regularly wore a “Mud Hens” cap. Why do I bring all this up you may be asking yourself? 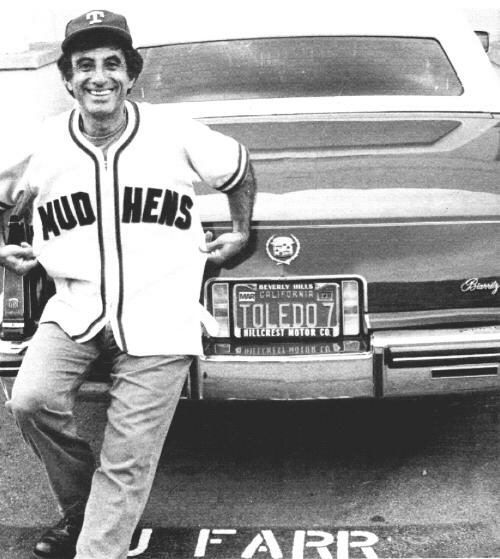 When I was younger, I would think about minor league baseball and instantly thought about the Mud Hens because of Klinger and “MASH”. Also, I had no idea what a Mud Hen was. I sometimes never question nicknames but I have been a lot lately. Teams that have unique names that I have seen on this trip are: the Albuquerque Isotopes, Reno Aces, Montgomery Biscuits, Jameston Jammers, Fort Wayne TinCaps, Omaha Storm Chasers, Colorado Springs Sky Sox, Quad Cities River Bandits, Wisconsin Timber Rattlers and Las Vegas 51’s. I looked up a few of the teams for the reason why they are named what they are. One of the biggest reasons I think that teams are changing names is financial. If a team comes up with a fun and interesting name, the fans are more apt to buy the team merchandise. Albuquerque Isotopes: The team’s name recalls the fictional Springfield Isotopes from the long running TV series “The Simpsons”. In the episode “Hungry, Hungry Homer”, which first aired on March 4, 2001, main character Homer attempts to thwart the team’s plan to move to Albuquerque by going on a hunger strike. Reno Aces: The team went with the name “Aces” since Reno is known for gambling and the “Aces” are the top cards in a game of poker. There is a baseball connection, also, regarding a baseball’s team top pitcher, who is often referred to as their “Ace”. Montgomery Biscuits: The Biscuits’ owners, Tom Dickson and Sherrie Myers, selected the team’s nickname from an entry in a “name the team” contest, due in part to the potential marketing and pun possibilities (ex. “Hey, Butter, Butter, Butter” or the team’s souvenir store, the “Biscuit Basket”). During games, biscuits are shot from an air cannon, into the stands. Jameston Jammers: Jamestown is located in Chautauqua County, a grape growing region in the state of New York. Fans voted for Jammers over many other nicknames but other teams and their fans didn’t understand what a Jammer was. So, in the off-season before the 2006 season, in an attempt to put an end once and for all to the “what is a Jammer?”, the Jammers changed their logo to a cartoon grape theme. Fort Wayne TinCaps: The name TinCaps was chosen following the 2008 season, alluding to John Chapman, better known as Johnny Appleseed. The Tin Cap refers to a fictionalized depiction of John Chapman wearing a cooking pot as a hat in the 1948 Walt Disney movie “Johnny Appleseed”. Although, this depiction has been disputed by historians. Chapman spent his final years in Fort Wayne and is buried in the city. Omaha Storm Chasers: Following the 2010 season fans had the opportunity to submit their choice of nicknames, as well as vote on the finalists. A list of 24 fan-submitted names was whittled down to nine finalists through voting on the team’s website, and the new name, “Storm Chasers,” was revealed. Colorado Springs Sky Sox: The Sky Sox nickname originated from their affiliation with the White Sox back in the 1950’s and the teams location in the high altitude Rocky Mountains. The Sky Sox are now affiliated with the Arizona Diamondbacks. Quad Cities River Bandits: The team was the Quad City River Bandits from 1992 through the 2003. On October 20, 2003, the team was renamed the Swing of the Quad Cities. The nickname, like the previous one, was the winning entry in another “name the team” contest. However, On December 13, 2007, the team announced it would return to the “Quad Cities River Bandits” after the former name was voted to be re-instated in a contest. Las Vegas 51’s: The 51’s take their name from Area 51 which is located near Rachel, Nevada, about eighty miles north of Las Vegas, as the crow flies. The actual route taken by car to get there takes about three hours. The team logo jokingly depicts one of the grey aliens, thought by UFO believers, that supposedly inhabits the Base. Well, the weekend is over and I am excited to write up my articles on the Clinton LumberKings play by play announcer and the Omaha Storm Chaser grounds crew. In addition, I will be doing an article in the future on the official scorekeepers at baseball games. I met Ron Kleinfelter, one of the official scorekeepers for the Toledo Mud Hens and the Detroit Tigers, who gave me some insight on the subject. And Klingers cap was really a Texas Rangers cap wasn’t it?